I don’t use celery very often, and I hate having to buy a whole bunch of it to get a stalk or two for a recipe. Luckily, I found the solution at a local plant sale – cutting celery! 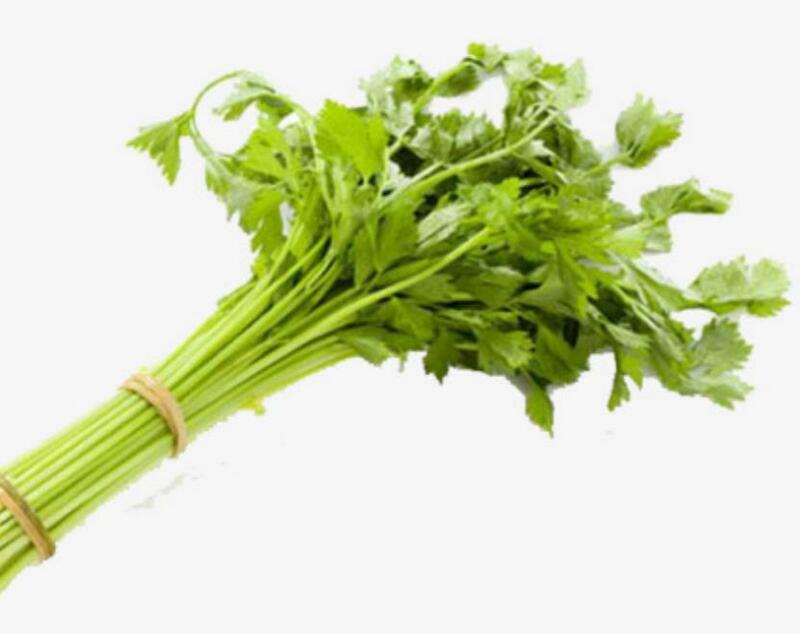 Cutting celery, also called leaf celery or Chinese celery, is pretty much like regular celery but in miniature form. The stalks are slimmer, about a quarter the width of a regular stalk. The taste is a little stronger as well, making it perfect for soups, stocks, and chicken salads. It’s also more heat tolerant and easier to grow than its larger cousin. The best part is, you harvest as needed, so you always have fresh celery on hand! In Florida, cutting celery is best started in late summer or early fall for the cool season. You can find seeds online from companies like Johnny’s Seeds, Hirts, and Jung Seeds. The tiny seeds need to be kept moist, so it’s easiest to start them in small pots that can be watered frequently – a clear cover can help hold in moisture. The seeds need two more things to germinate: light, and temperatures around 60-70 degrees. If you are starting them in summer for fall transplanting, that means keeping the pots indoors in the air conditioning near a sunny window. Scatter the seeds over good potting soil, several to a pot, and water in – remember, they need light, so don’t cover them with a lot of soil. Then, exercise patience…. celery can take up to three weeks to germinate. Once the seedlings are up, thin to one per pot. A deluge can easily topple the fragile stems, so when the surface of the soil dries, set the pot in enough water to cover the drainage holes and let it soak for five minutes. Don’t worry, once the seedlings get going, they are vigorous growers. Transplant them to the garden anytime from September to March. In the cooler months celery will grow in full sun, but if you are planting in spring consider giving it afternoon shade to prolong harvests into the hot weather. It generally grows 18 inches wide, and you can cut stalks as needed from the outside of the bunch. 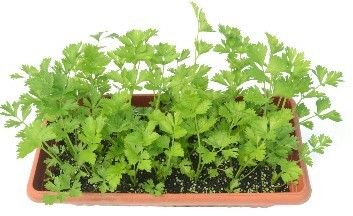 One or two plants provide me with plenty of celery for a weekly pot of soup. Since the stalks are slim, use 3-4 of them per regular stalk in a recipe. There aren’t many pests that bother celery, but there is one that you may welcome – the black swallowtail butterfly. In my garden it prefers parsley, but when that’s been munched to bare stems, the butterflies will settle for other plants in the same family such as dill and celery. They flutter over the plant looking for the perfect spot to lay a single egg at a time, which will hatch into a small, unsavory-looking brown caterpillar with a white “saddle.” The larvae will eventually grow into the more familiar bright yellow, black, and white striped version before hiding away in a chrysalis. Consider planting extra to share! 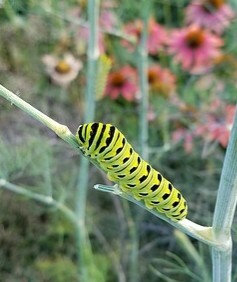 Black Swallowtail caterpillars may be an uninvited but welcome guest. 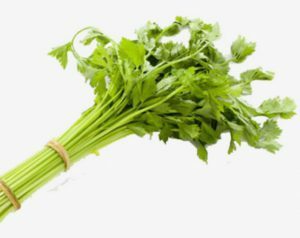 Cutting celery is an underutilized plant that not many gardeners are aware of. I start extra pots, as culinary-inclined friends are always happy to receive a plant. And if your older celery plants flower, bonus! Let flower heads dry before gathering and you’ll have plenty of seeds for next year.